In February 1998 Madonna’s new album was literally a ray of light in stodgy UK charts made moribund by the Britpop comedown (Oasis’ Be Here Now, Stereophonics et al), and industry hits like the Titanic soundtrack. In the US it wasn’t much better, with Celine Dion and Garth Brooks at the top. The only other women on the album chart were Spice Girls, All Saints and Aqua, so unsurprisingly Madonna saw off the competition with aplomb. 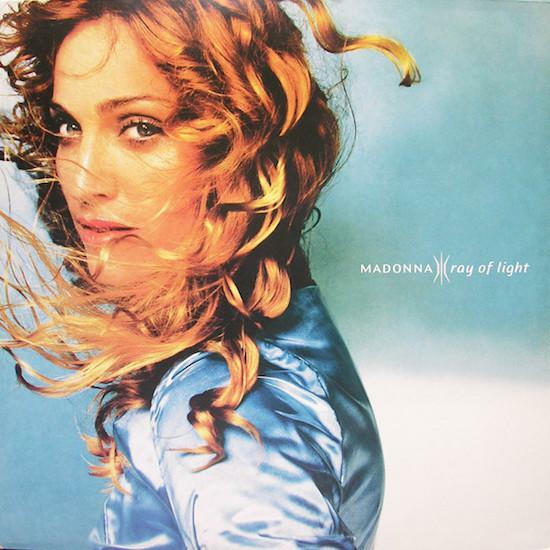 With its icy electronica and pulsing beats, Ray Of Light appeared as the pick-me-up for rave generation. It marked Madonna’s maturity as an artist, brought the MOJO demographic on board, and signalled to the world that a so-called pop bimbo can break down the barriers of that pop/rock divide. However, it hadn’t been an easy journey, and despite its sunny title the album is a voyage into the darkness and terror of grief. Like Dark Side Of The Moon, it is an elegiac study of ego, mental disintegration and the fear of death. Pink Floyd’s epic drew on ‘70s psychoanalysis, R D Laing and the divided self, while Ray Of Light captures the 90s zeitgeist with its references to Kabbalah and the subconscious. Dark Side uses the sun and moon as symbols of life and death, while Ray Of Light revolves around the duality of sea and sky. Both albums require the listener to go the whole journey to get the full effect. Ray Of Light was created in old school prog rock fashion – with mainly one producer, over a period of months, in an intensively collaborative process. “She produced me producing her,” said William Orbit. Recorded in a modest studio in an unfashionable part of LA, the album was intentionally un-industry. Early sessions with Babyface were shelved, and Madonna’s longtime producer arranger Pat Leonard was sidelined in favour of an awkward English eccentric whose hardware kept breaking down. Although Orbit’s perceived amateurism made her nervous, Madonna knew from his dancefloor remix of 1990’s ‘Justify My Love’ that he could create the futuristic tone she craved. With Bass-O-Matic’s Set The Controls For The Heart Of The Bass (named after a Pink Floyd album), and the rave anthem ‘In The Realm Of The Senses’, Orbit had already declared an interest. Kabbalah and new motherhood opened Madonna’s mind, but it was the alchemy between her and Orbit – his trippy underground vibe and her willingness to experiment, that triggered her transformation of consciousness. With Ray Of Light they created the sonic space and musical textures for the sparse poetry that’s embedded in her songwriting. Previous hit-driven albums, with the exception of moments on Like A Prayer and Erotica, hadn’t allowed room for that potential to emerge. For the first time she could express herself in-depth. Madonna did her background reading – everything from JG Ballard to Anne Sexton to Shakespeare’s sonnets were inspirations here – and did lengthy songwriting sessions with Leonard and Rick Nowells (“her lyric writing was poetic and intelligent,” the latter says, “she knows how to channel a song”) before she set foot in the studio. Once there, little Lourdes was installed in a playroom, and Madonna focused on the tracks that would eventually piece together a story. “I traded fame for love/ Some things cannot be bought… Now I find/ I’ve changed my mind,” she sang on opening track ‘Drowned World/Subsitute for Love’. The apocalyptic dreamscape of JG Ballard’s Drowned Worlds sets the tone. From there she moves into ‘Swim’, a low-slung electro song where Madonna delves into the religious themes of her pop past as the Sin-eater, carrying “these sins on my back”. ‘Ray of Light’ then provides a giddy moment of reawakening, with Orbit pushing her to sing a semitone higher than her comfort zone in order to stretch out that sense of hedonist abandon. This is the song, with its accompanying Jonas Akerlund video – all speeding lights, winking urbanscapes and fast motion skies – that relaunched her career, that married techno beats to cranked-up oscillators and wall-of-sound pop, and begged the question, did Madonna neck a zesty pinger? The ecstatic moment melts into the addiction, obsession and dirty bass distortion of ‘Candy Perfume Girl’. Boy, girl, boy, girl, it’s all candy, it doesn’t matter. Aimless distraction gives way to the ghostly anime of ‘Skin’, a truly chilling track with Madonna’s voice gliding over the top of feverish psychedelic chaos, trying to catch something she can’t reach. In the same way that Pink Floyd’s ‘On The Run’ used a proto acid house pulse and electronic effects to create a feeling of unsettled angst, so Orbit’s pulverising techno suggests a dissolution of self. By the sweeping chorus of ‘Nothing Really Matters’ Madonna has found a way to slough off the feral, fame-hungry mindset that drove her to the top of the 1980s music industry, but which no longer serves her. “I lived so selfishly/ I was the only one/ …I realised that no one wins,” she sings in a moment of revelation. A sanskrit chant links into the desolate suffering of ‘Frozen’, Madonna’s big ballad ‘Us And Them’ moment. All of them pile in – from Orbit and Marius De Vries’s shifting dynamics and glacial production, to Leonard’s aching arrangements, to Chris Cunningham’s manga-inspired video depicting her as a witch goddess swooping through desert plains – perfectly capturing the sadness that kept her heart locked down. Although Madonna’s sound is usually demarcated by simple verse/chorus pop logistics, she is also good at unresolved yearning. From as way back as 1984’s ‘Borderline’, she knows how to defer, to anticipate, to wish for, but with no resolution. The songs ‘Learn To Say Goodbye’, with every word carefully annunciated, and ‘To Have And Not To Hold’, with its brooding bossa nova beat, bear this out. She is nearly there, caught in a state of tension. There is a brief flowering of motherly love with ‘Little Star’, a skittering reflection on her baby daughter. But this, eventually, is what gets her in touch with her own mother and the source of her pain. ‘Mer Girl’, the final track on the album, is Madonna’s ‘Brain Damage’, that moment when the lunatics are on the grass. Having travelled through psychological soundscapes, here she is in a nightmare with a hallucinatory black sky, running through the rain with matted hair to a place with “crawling tombstones”. In the same way that Gilmour and Waters worked with the spaces between notes, Orbit’s ghostly glitches and fragmented synths give way to silence, and Madonna’s voice drops to a cracked little-girl whisper: “I smelled her burning flesh/ Her rotting bones/ Her decay.” And it’s that image of her mother, buried alive, that makes Madonna realise what she has been running from all these years. “When she recorded that in the booth, we sat in silence, our hair standing on end,” Orbit said. Resisting the urge to tie it up with a neat transcendent finale, Madonna finished the album there, without resolution, “still running away.” As in Pink Floyd’s closing ‘Eclipse (“everything under the sun is in tune/ But the sun is eclipsed by the moon”) she acknowledges that even when everything seems all right the dark side will haunt you. That refusal to create a happy ending is what makes Ray Of Light a masterpiece, and why it won four Grammys, and why it is in all those canonical ‘Best Of’ lists. It wasn’t an album made by committee, in five minute blocks by songwriting teams. Like Dark Side Of The Moon’s crisis of post-war masculinity and madness, this was a painful rebirth, calibrated with emotional intelligence and electronic precision. All you create and all you destroy indeed.